The simulator portion is just as important as the interview portion. For those of you who have difficulty flying the simulator, now is the time to brush up on those skills. Make the mistakes with us rather than on your sim ride. Then you can go in with confidence. 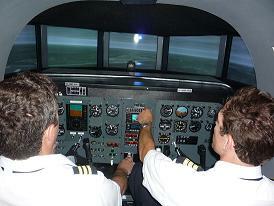 We can combine your simulator training with your interview review if it is easier for you. Call us today and we can discuss the sim ride and how to customize it to your specific interview. We will review call-outs and two-man crew dynamics for those of you making the transition. The important thing is be completely prepared for the interview day.